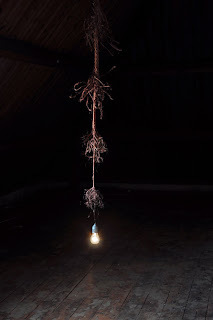 French designer Charlotte Dumoncel d’Argence presented a lamp featuring bare, frayed electrical flex at an exhibition in Zona Tortona, Milan '09. "Everyday alarming information all seem to merge into one conclusion: our world in unrelentingly going forward to its end. The contemporary Vanitas are melancholically questioning the fate of our society. They are conveying a disenchanting vision of our world, celebrating the pleasure of what is now while meditating on its fragility. The massive copper cable gets loose and ramifies into nothingness. The light bulb itself dangles from a thin copper; the whole object freezes in time its decaying process." On her site you can follow where the Vanitas lamp is now.